Kyle A. Wolber, EMT-B, currently serves as the Operations Liaison for Superior Air-Ground Ambulance Service in Illinois. Since May 2016, Kyle has been committed to helping Superior in all aspects of operations. Kyle is a dedicated professional with six years of experience in Emergency Medical Services and non-emergency ambulance and an EMT-B. 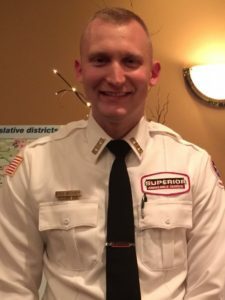 In 2006, Kyle began his role in EMS as a Firefighter/EMT-B for the Franklin Grove Fire Protection District, running approximately 1,500 calls a year for his local community as a paid-on-call. While serving his community, Kyle assisted in running a Congressional office for United States Congressman Bill Foster (D-IL 11th District), which he credits as one of his life’s peak moments. In 2009, Kyle left the EMS community to enlist in the United States Army as a combat soldier. Kyle served a total of six years, and advanced to the rank of Staff Sergeant before leaving active duty with the 82nd Airborne Division. Kyle is a decorated war hero, serving one tour in Iraq and two tours in Afghanistan, earning himself a Bronze Star among many other awards. Kyle now serves in the Illinois Army National Guard as a Sergeant First Class, running a platoon of soldiers for his unit. Kyle re-instated his license as an EMT-B and came to join the family at Superior Air-Ground Ambulance Service. Kyle began working on an ambulance and quickly advanced up to his current position. Kyle currently plays an active role in his community with the American Legion, VFW, and Citizen’s Police Academy. In his spare time, Kyle enjoys helping his family farm corn and beans in Northern Illinois, where they have horses, hogs, and cattle. Kyle loves to workout, Jet Ski at his family’s lake house in Michigan, and spend time with his friends and family. Superior Air-Ground Ambulance Service is proud to recognize Kyle as a 2017 Star of Life.